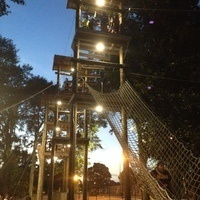 Ever wanted to try out the challenge course, but didn’t have a group to go with? Adventure Education will be hosting open challenge course hours for you and your friends to come out and hop on the high course. All you have to bring is athletic clothing and closed-toed shoes and you will have the opportunity to go through all six high elements on our 25 ft. lower level and 35 ft. upper level. For an added bonus, Adventure Education has installed light fixtures on the course, giving us the opportunity to allow you to try out the high course at night so come join us for this exhilarating experience!